Private taxi: It is about a 1½ hour drive in a private taxi. Price will depend on the size of the vehicle and your ability to bargain. Share taxis: These are jeeps that hold about ten people. They can be booked for 60 rupees per seat. 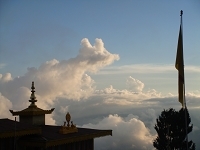 Share taxis can be found behind what is referred to as the Tenzing Norgay Bus Terminus on Hill Cart Road (this is not to be confused with the statue of Tenzing Norgay at Darjeeling Moore). The station is on the west side of the road about one kilometer north of the Mahananda River. Locals also know it as the Central Bus Stand. See Google maps. 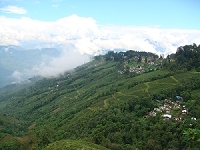 Private taxi: The ride from Darjeeling is about two hours in a private taxi. Share taxis can be gotten for about 70 rupees per seat. They can be booked on the north or far side of the bus stand on Hill Cart Road pass the bus stand.